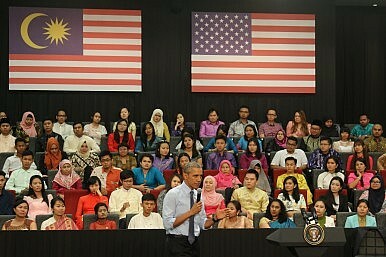 President Barack Obama hosts a Young Southeast Asian Leaders Initiative (YSEALI) Town Hall in Kuala Lumpur, Malaysia in November 2015. Its true significance lies in what it means for the current and future place of Southeast Asia and ASEAN in US policy. From February 15-16, U.S. president Barack Obama will host Southeast Asian leaders as well as the ASEAN Secretary-General for a special summit at the historic Sunnylands Center in Rancho Mirage, California. While observers may be looking for headlines on big-ticket items such as the U.S.-led Trans-Pacific Partnership (TPP) and Chinese assertiveness in the South China Sea, the true significance of the Sunnylands summit lies in what it means for the current and future place of Southeast Asia and ASEAN in U.S. policy. First, the summit attests to the importance that the Obama administration has attached to the subregion during its two terms in office. Arguably the most significant aspect of the administration’s rebalance to the Asia-Pacific has been the greater share of attention devoted to Southeast Asia as well as ASEAN as a whole within U.S. Asia policy – what some officials privately term “the rebalance within the rebalance.” Over the past few years, the United States has ratified the Treaty of Amity and Cooperation, become the first non-ASEAN country to appoint a resident ambassador to ASEAN, joined the East Asia Summit and institutionalized annual U.S.-ASEAN summits. These are no small feats for a U.S. Asia bureaucracy that still continues to be largely dominated by Northeast Asian concerns. The convening of first-ever standalone meeting with Southeast Asian leaders in the United States next week is yet another powerful symbol of this administration’s commitment to Southeast Asia. But it is also not without substance. As those involved in the planning of the summit point out, having a full day-long worth of interactions between U.S. and ASEAN leaders rather than the annual hasty interactions amid Asian summitry is a rare and valuable opportunity to delve deeper into critical issues at the highest levels. Second, the summit an opportunity to make tangible progress on advancing the U.S.-ASEAN relationship. Last November, the United States and ASEAN elevated their relationship to the level of a strategic partnership and laid out a concrete plan of action to implement it out to 2020. While officials have stressed that the Sunnylands summit will be deliberately more informal relative to traditional annual U.S.-ASEAN meetings, the two sides will nonetheless look to move the dial in two planned retreat sessions on economics and political and security issues as well as a working dinner. For ASEAN, the summit is an occasion to demonstrate its importance in tackling regional and global challenges ranging from climate change to the Islamic State. Though the grouping has played an often unappreciated role in keeping the peace in Southeast Asia as well as managing an increasingly complex regional architecture, for Washington, ASEAN’s tangible contributions to resolving the problems of today and tomorrow is ultimately where the rubber meets the road. Anxiety has already surfaced that this year’s ASEAN chair, Laos, may be less willing to push the envelope on key issues relative to Malaysia, with the landlocked communist state being relatively more insulated from challenges like violent extremism, the South China Sea and the refugee crisis. The Sunnylands Summit provides an early chance in 2016 to dispel these fears irrespective of how unfounded they may be. For the United States, this is an opportune moment to build out its economic approach to the region as a whole. Apart from the TPP which only includes four ASEAN countries, the Obama administration has struggled to find new and specific region-wide initiatives that fit the diversity of Southeast Asian economies. While capacity-building efforts like the Expanded Economic Engagement initiative and technical assistance programs like the ASEAN Connectivity through Trade and Investment have been steps in the right direction, more can be done in fields such as infrastructure development and innovation and entrepreneurship. This will be a focus not just at Sunnylands, but also at other events following it including an economic roadshow as well as a conference organized by the U.S.-ASEAN Business Council in San Diego to be held on February 17. Third and lastly, with Obama now in his last year in office and the U.S. presidential race heating up, the Sunnylands Summit is an ideal time for his administration to signal the importance of ASEAN to its successor. Obama’s advisers say that much like his unprecedented hosting of African leaders in the United States which took place 2014, Sunnylands is a way for the president to highlight that Southeast Asia ought to be a key priority for the United States going forward and that engaging the subregion at the top level is crucial part of that engagement. Sending that message is vital because even though the Obama years have seen a strong commitment to Southeast Asia and ASEAN, with the notable exception of Hillary Clinton – the first secretary of state to visit all ten ASEAN countries – there is no guarantee that any of the other U.S. presidential candidates would necessarily demonstrate the same regard for the subregion. Indeed, with the next U.S. president likely to confront a more tumultuous and fragmented world – with a dangerous Islamic State, simmering Middle East, resurgent Russia, frail Europe and weak global economy – there is a risk that Washington will have much less patience for multilateralism and will engage much more selectively with individual ASEAN states rather than the region as a whole. That would be a tragic mistake given ASEAN’s growing clout as well as the investments this administration has already made in recognition of this. Sunnylands is a golden opportunity to reinforce that point by locking in what has already been achieved and making headway on what remains to be done. US-ASEAN Sunnylands Summit: What to ExpectObama Unveils New ASEAN Economic Initiative at Sunnylands Summit Trump’s Real ASEAN TestWhat Did the US-ASEAN Sunnylands Summit Achieve?A ‘Special’ US-ASEAN Summit in Sunnylands in 2016?